True cottage housing developments are a smart new choice in Northwest housing and the perfect solution for a smarter, energy efficient, and environmentally responsible lifestyle. These pocket neighborhoods of “not-so-big,” detached homes are designed to live large. With conversational front porches oriented to internal pedestrian “streets” and gardens, cottage housing promotes neighbor-to-neighbor contact while reducing the impact of cars. A centrally located commons building expands your private entertainment options and serves as a venue for neighborhood gatherings, exercise classes or craft events. The common area landscape features edible fruits and easy to maintain native plants. There is even a community “pea patch” garden where residents can grow their own vegetables. The clustered site design and green construction lessens the environmental impact and provides residents with a lower annual cost of living. From the homes that require less energy, to the smaller yards that require less maintenance, to the low impact development (LID) common areas, cottage housing is the perfect choice for today’s lifestyle. Infill pocket communities of “not-so-big,” custom-quality homes with covered front porches facing common open areas and gardens. Emphasis on quality and efficiency of design. Build a third less space for the same construction cost. Average size of 6 to 16 homes and detached garages carefully integrated into the surrounding neighborhood. Cottage housing is obtainable, energy efficient, small footprint living that lowers your annual expenses and maintenance concerns. “Not-so-big” homes are surging in popularity and on-trend as American housing booms. Integrated covered porches (outdoor rooms) support indoor/outdoor living. Integrated site and home design provides a desirable layering of public and private spaces. These pocket neighborhoods support a heightened sense of security, community and a desire to live a simple, environmentally responsible lifestyle. The most advanced low impact development (LID) techniques are incorporated into the land planning of our developments. Standard developments consolidate contaminated storm run-off from impervious surfaces with catch basins, pipes, and ugly fenced detention ponds (aka rainwater prisons). This oil and chemical laced water is eventually discharged into the Puget Sound. A basic tenet of the LID approach is capturing storm water run-off as close to its source as possible and naturally infiltrating it back into the earth. This recharges the local eco-system and keeps pollutants out of our waterways. Nexus Studio projects accomplish storm water LID by utilizing three major techniques. Pervious concrete with an infiltrative gravel gallery beneath all driveway and parking areas, rain gardens dispersed throughout the project for roof run-off and ground area sheet flows, and below grade infiltration trenches for the newly paved public street areas when soil conditions allow. These techniques eliminate the need for surface detention ponds or expensive underground rain detention vaults and increase the amount of usable green space in the project. Rain gardens turn an aesthetic dilemma into an attractive lifestyle feature. Market driven LID techniques, as implemented by The Nexus Studio, can actually save development costs and simultaneously deliver an environmentally responsible green solution. Rain gardens are shallow rain water detention areas that when properly designed, create an attractive, garden like storm water management feature. These technically engineered drainage facilities are designed to collect up to 12 inches of storm water and dissipate it within 24-36 hours. Rain gardens, as designed by The Nexus Studio, are usually large in scale with integrated viewing decks, stepping stone paths and park benches in order to draw the residents into the gardens. 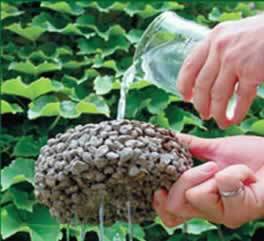 Pervious concrete is a special concrete mix that retains its traditional strength but allow liquids to pass through it. In the case of pervious concrete streets, driveways, parking lots, patios and sidewalks, this means the storm water falling on its surface can be collected in an underlying gravel gallery and infiltrated directly back into the soil, or detained and released slowly into the storm water system. This greatly reduces the size of required rain water detention ponds or rain gardens. True cottage housing developments are a smart new choice in Northwest housing and the perfect solution for a smarter, energy efficient, and environmentally responsible lifestyle. These pocket neighborhoods of “not-so-big,” detached homes are designed to live large.